This spooky fellow happily sits in the pumpkin patch waiting for the Great Pumpkin. Colorful Peyote bands decorate the 24% lead crystal chandelier drops. Cast beautiful rainbows as sun catchers, lamp & fan pulls, & holiday ornaments. Quick to stitch in about 2 hours. 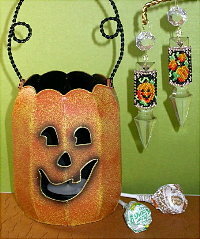 Makes a fun hostess gift for that Halloween party!